NEXT-GEN FILTRATION - The FlowXtreme Plus features Cotton Tails filter media, a state-of-the-art technology that blows sand and cartridge filters out of the water. 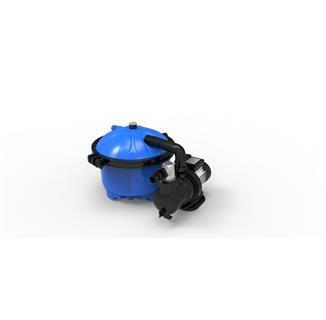 Cotton Tails is a simple, low-maintenance solution that filters your pool down to 3 microns. QUIET AND EFFICIENT - Filter up to 2,100 gallons/hour with steady, dependable efficiency. With a 0.5 HP motor and a max head of 25-ft, this durable system is a perfect solution for soft sided pools. Keep your water clean and clear with minimal noise. 1 YEAR WARRANTY - Your product comes with a one-year manufacturer warranty. Your item will arrive damage free with all necessary parts and accessories. If something goes wrong, we'll work tirelessly until you're satisfied with your product.